In this week's class we considered how the relationship between e-books as "content" and various e-book file formats (such as EPUB, the Kindle formats, and PDF) as "containers" isn't so simple. This week's blogging question asks you to share a specifically digital example of a case where the line between content and container has become blurred. What's that "<ed space>" doing there anyway? My best guess is that it's a digital typesetting code that was supposed to remain invisible, along with myriad others required to help a text become printable sheets, but in this cases was inadvertently printed along with the text. Note that if you read the text around it, this seems like a natural place for a blank linke to indicate an ellipsis in the narrative. A cursory search of quick reference guides to the TeX typesetting system (following a hunch), has revealed nothing, and a broader search for "<ed space>" on Google (incl. 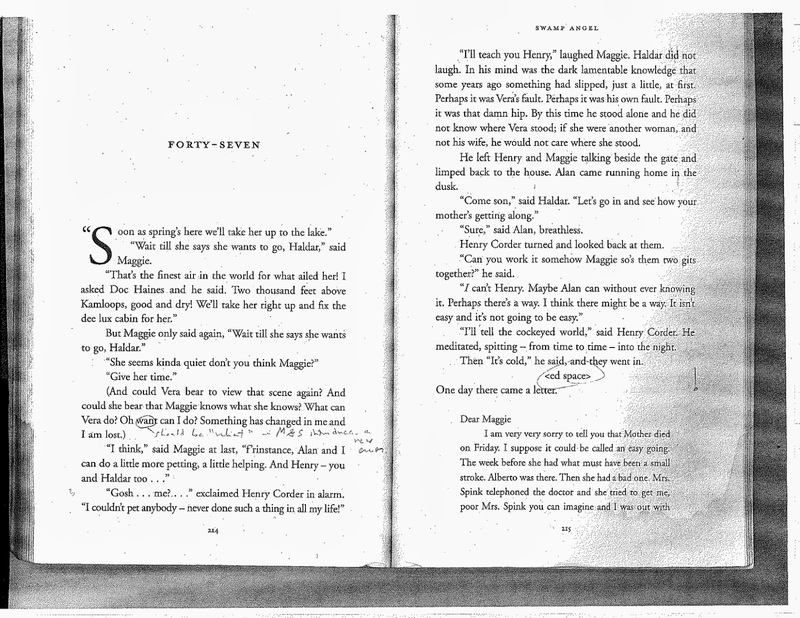 Google Books) seems difficult because Google disregards the angle brackets -- though I haven't exhausted that avenue yet. A more sensible approach, from which I'd likely learn more than I would from Google, would be to show this to someone who works with modern typesetting software, who'd likely recognize it immediately. Whatever the specific technical cause, it's a glitch in the matrix, or a glimpse behind the curtain as the stage hands set the next scene, or as D.F. McKenzie put it, an instance of the "human presence" discernible in "any recorded text" (p. 29). What examples can you think of that show the supposedly seamless world of "content" being disrupted or otherwise affected by that which contains it? Remember, your example doesn't have to be from a book or even textual, but it should be digital. D.F. McKenzie. Bibliography and the Sociology of Texts. Cambridge University Press, 1999. Ethel Wilson. Swamp Angel. Toronto: McClelland & Stewart, 1990.